DS Virgin Racing will take to the streets of Beijing next weekend with a new driver line-up, new partners, a new powertrain and plenty of momentum. 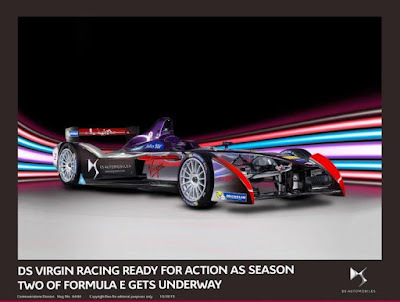 The FIA Formula E Championship returns for a second season in Beijing on 24 October and the DS Virgin Racing team will be looking to continue where they left off at the end of season one. Back in June, home favourite Sam Bird stormed to a win in the final round in London. The British driver will be looking to build on a promising first season – which also saw him pick up a win in Malaysia – alongside new recruit, Frenchman Jean-Éric Vergne. With the arrival of the DS brand, the race car also has a new look for season two. Combining the DS and Virgin brand identities, the new design represents a dynamic integration of both the DS Automobiles and Virgin colour schemes, and maintains the distinctive red and chrome features from season one. The DS brand logo now appears proudly on each side of the car on a black background, alongside fellow partner Hewlett Packard Enterprise. The battery cover remains purple as in season one. It is not just the outside of the car that is different. 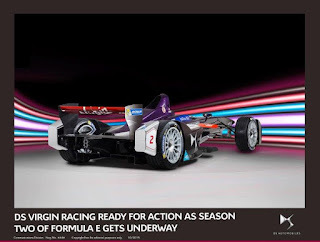 Changes to the technical regulations have enabled teams, including DS Virgin Racing, to develop their own electric powertrains for season two. The team has chosen to re-design its powertrain significantly in order to increase efficiency – and in order to account for the increase in race power allowed in season two, which rises from 150kW to 170kW. This package was tested extensively in the pre-season and proved to be reliable, but it is difficult to predict how it will stand up versus the competition until all of the teams hit the streets in Beijing. 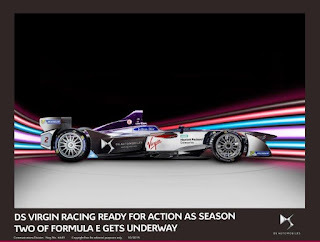 Additional changes to Fanboost, meanwhile, will give fans the chance to vote for Sam and Jean-Éric until six minutes into the race, providing a power boost of 100kJ of additional energy that can be used during the rest of the race. “It is unbelievable how quickly a year goes by. This time last year, we entered into the relatively unknown world of electric racing, during the first season we learned a great deal and have developed strongly as a race team. I believe we have brought great talent into the team both on and off the track and adding this to the experience learned in the first year I feel confident we will deliver a strong performance in the coming season starting right here in Beijing.